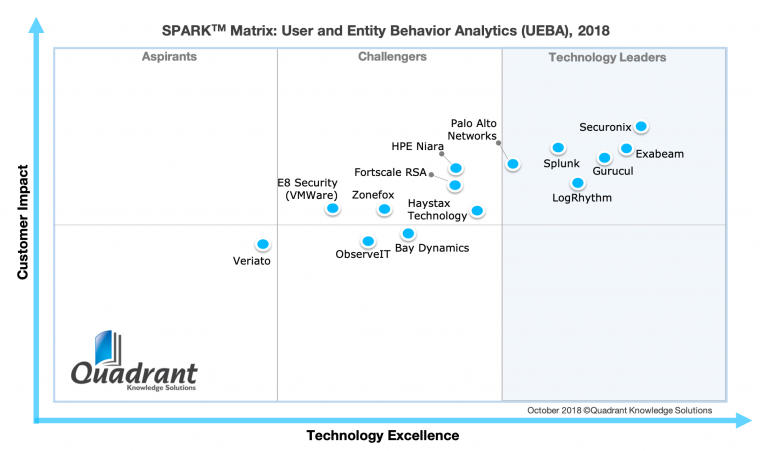 Securonix, a leading provider of user and entity behaviour analytics (UEBA) and next generation of security analytics solution has been positioned as the 2018 technology leader in the SPARK Matrix analysis of the global UEBA market by Quadrant Knowledge Solutions. The research "Market Outlook: User and Entity Behavior Analytics (UEBA), 2018-2023, Worldwide", analyzes market dynamics, technology trends, short-term and long-term opportunities and the vendor ecosystem of the global market. This research provides strategic information for users to evaluate different vendor capabilities, competitive differentiation, and their market position. Securonix provides a comprehensive set of proven cybersecurity solutions to detect advanced insider threats, cyber threats, fraud, cloud data compromise, and non-compliance. The company is making strong advances in the security information and event management (SIEM) market by providing Securonix SNYPR, the next generation security analytics platform. Built on an open big data platform, Securonix platform combines patented machine learning, behavior analytics, log management, threat hunting, and intelligent incident response capability to offer next-generation SIEM solution. Securonix also maintains a proactive pulse on the latest cybersecurity threats and incidents through its Securonix Threat Research Labs which provides cutting edge threat research advisories to protect against advanced attacks. "Securonix is well recognized for delivering a comprehensive UEBA and next-generation SIEM solution to enable end-to-end security monitoring to predict, detect, investigate, and respond to advanced insider and unknown threats," said Divya Baranawal, Industry Analyst at Quadrant Knowledge Solutions. Baranawal adds "driven by its sophisticated technology capabilities and strong customer value proposition, Securonix has received the highest overall ratings on the SPARK Matrix analysis included in the report and is recognized as the 2018 technology leader in the global UEBA market." Securonix is redefining the next generation of security monitoring using the power of machine learning and big data. Built on Hadoop, the Securonix solution provides unlimited scalability and log management, behavior analytics-based advanced threat detection, and intelligent incident response on a single platform. Globally, customers use Securonix to address their insider threat, cyber threat, cloud security, fraud, and application security monitoring requirements. Quadrant Knowledge Solutions is a global advisory and consulting firm focused on helping clients in achieving business transformation goals with Strategic Business and Growth advisory services. At Quadrant Knowledge Solutions, our vision is to become an integral part of our client's business as a strategic knowledge partner. Our research and consulting deliverable is designed to provide comprehensive information and strategic insights for helping clients formulate growth strategies to survive and thrive in ever-changing business environments.